March - Looking back, the month was quite eventful but sometimes we get so hooked on something happening every week that if it's a normal week then it seems like an anticlimax. We went to the Royal Theatre to see our first play there since the refurbishment. The play didn't meet our expectations and although it was billed as a comedy the laughs were few and far between. The local newspaper wrote the following critique: Soap is a new comedy written by Sarah Woods and, as the name suggests, it pokes fun at the world of TV soap operas. It's packed with cliff hanger moments and knowing looks that are the mainstay of the TV soaps. The play follows Lorna, the barmaid of the pub in Arthur Street, who falls through a wormhole in space to find herself mixing with Thorn, a hunky surfer dude from Crystal Bay. 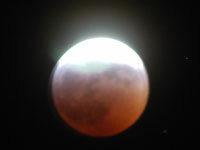 The prospect of a full lunar eclipse excited our imaginations and we were blessed with crisp, clear skies. Taking photographs of astronomical events isn't as easy as you might imagine. Without the use of special lenses we managed to get this image. Flood watch warnings were issued throughout Northamptonshire following heavy rain over the first weekend. More than 12 millimetres fell during the Friday night. The Environment Agency confirmed that several parts of the River Nene and the Great Ouse were under flood watches and warned that more flooding could affect the county the following week. 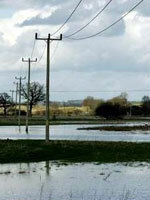 Fields around Flore and between Church Brampton and Brixworth were flooded as a result of the rain, with football pitches at Spencer Football Club in Kingsthorpe under about a foot of water. It says something for the millions of pounds spent on flood defences and monitoring systems because although the flood plain was awash the water didn't encroach on any habitation. The best TV programme ever! That's a bold statement but "Life on Mars" was something we both looked forward to every week. This is the second series and will be the last - how will it end? Jane's brother, Richard, called in to see her during the month (Steve was at work). 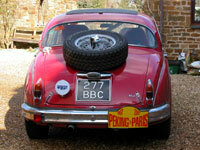 He came in the classic rally car that he is preparing for the Peking to Paris rally in the next few months. It looks a great vehicle with a superb registration. We hope he makes it through the trials and tribulations that Richard and Nicola will no doubt experience. Jane's father used to own a similar Jaguar to this - it was his pride and joy. We've been neglecting the garden of late. There was a time when we'd spend every hour of the weekend digging, weeding and planting but somehow we've lost the impetus but there's still plenty to do. One of the reasons for our indolence is possibly the poor soil - ten years ago the garden was under concrete. 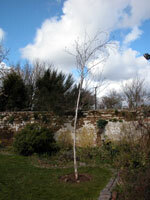 This silver birch has been in the garden for over five years and it hasn't grown at all, it's the same height and thickness as when we bought it. As a last ditch attempt to rescue it we've moved it out of the flower bed and into the lawn. We dug a hole over a metre deep to make sure there was a chance for the tree to survive and now we wait. When we first moved into the Pig Yard ten years ago we inherited a dark oak kitchen and Jane fairly soon afterwards put a lot of hard work into painting them white. Three years ago we removed a plinth so that we could have a kitchen table in the middle of the room. 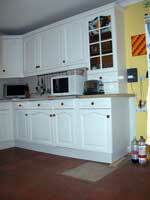 We decided last year that we would have the kitchen completely refitted. So far we've selected the unit design; drawn up the plans; purchased the units and the white goods; purchased the floor tiles to a McCarthy design with a mosaic motif. All that is left to do is to get the old floor tiles removed, floor screeded and new tiles laid at which point we can get the units installed. Project managing this ourselves has been quite stressful with changed dates causing considerable rescheduling. We are in the process of selecting worktops but the whole refit has had to be put back until May because the tiler wasn't available at a critical point.